478 students received their certificate of completion of the Western Mindanao State University (WMSU) Job Enabling English Proficiency (JEEP) program at the Grand Astoria Plaza last April 8. This year’s JEEP finishers belong to the second batch of students who have accomplished the JEEP project. As a requisite for completion of the short course, the students complied with the JEEP-Start which focuses on the student’s proficiency in general English and JEEP-Accelerate which concentrates on specialized English skills required by employers. Growth Equity in Mindanao (GEM) Deputy Program Manager for Workforce Preparation and Governance- Michael G. Langsdorf congratulated the JEEP finishers during his message. He underscored that the JEEP program is not an easy course and that he is proud of how far the finishers have gone through with it. He said that change is rapid and that the mastery of the English language is another tool in the bag of skills of a new graduate. On the other hand, Dr. Milabel Enriquez-Ho -Vice President for Research, Extension and Development likened the JEEP project to the Philippines’ very own public utility jeepney. Dr. Enriquez-Ho compared the successful finishers to the passengers of a regular jeepney, in which they journey together to achieve a common goal, that is to attain mastery of the English language. She also commended the efforts and skills of the ‘JEEP drivers’, who are the program facilitators for a job well done. 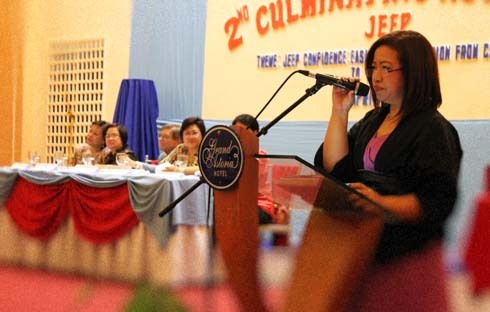 Wishing that the JEEP project will continue to offer what it offers best, WMSU OIC-President and concurrent Vice President for Academic Affairs-Dr. Carmelita M. Felisilda expressed her appreciation of the status of the JEEP program during the delivery of her words of support. Dr. Felisilda also mentioned that the project deserves to have an edifice devoted for its sole operation and she hoped that it will gain future support for its establishment. and Entizar A. Ibrahim (Bachelor of Secondary Education) ranked third with an average of 1.43. The top three outstanding finishers were given the opportunity to deliver their testimonies with regards to the JEEP initiative. “We all turned into JEEP likers…To all JEEP likers out there, thank you for the likes,” Prof. Julie Uy-Cabato-Language Development and Resource Center Director and JEEP Program Coordinator used the famous Facebook lingo during her welcome address. Prof Uy-Cabato is one of the ardent prime movers of the program. The program now is being appreciated and supported by the students, faculty and employers alike for its positive impact in the communication skills of a JEEP student.